The following is a direct copy/paste from a newsletter I receive. Admittedly, at the end of the piece, a book is advertised. But, please, read the material. Everyone, in my opinion, owes it to herself/himself and all loved ones to get, and use, this information! It’s called galloping breast cancer. And, well, it’s just as terrifying as it sounds. It certainly wasn’t what 58-year-old publishing mogul Kathy Kellman wanted to hear from her oncologist. Kathy’s doctor told her she had stage 4 “galloping” breast cancer. That means the cancer was racing through her body at a breakneck pace. Her doctors gave her six weeks to live. So, Kathy refused chemotherapy and opted for this solution along with radiation for one of her many tumors. It worked. A year after her predicted death date, she was in remission. George Teller was 45-years-old when he was diagnosed with metastatic prostate cancer. He was in absolute agony. Yet returned to his normal life after using this treatment. Her doctors had been treating her metastatic uterine cancer for five years without success. It had spread all the way up to her neck. She reported online that she tried this secret salt… After only a week, she felt the neck tumors dissolving. And things only got better from there. Yet you won’t hear a peep about it from the mainstream. This cancer-destroying salt makes sense…but it makes no profit. Just one round of chemo costs the same as a 10-YEAR supply of this treatment. And—unlike chemo—which withers and wastes patients away—this solution helps people gain weight, increases appetite, provides pain relief, and even improves mood. In a moment, you’ll discover the sheer amount of peer-reviewed research confirming this compound works (in respected journals like the Lancet, Oncology, and Nutrition and Cancer). And—most important of all—you will see how you could access it for yourself or a loved one. Just looking at it, it doesn’t seem very special—a white, powdery substance. Not much different than table salt. Because it attacks the disease in a very unique way. You know how people with cancer get extremely thin and frail when they’re sick? Well, more often than not, that’s what kills them. Not the tumors. Their bodies literally starve themselves to death feeding the cancer. It’s a lethal side effect that nobody ever talks about. Yet according to some experts, this “wasting syndrome” is responsible for up to 73% of all cancer deaths. And this compound is the only way we know of to reverse it. No drug can. In the 1970s, Dr. Joseph Gold—founder of the Syracuse Research Institute—developed this therapy and published his early study results in the journal Oncology. He administered the salt to cancerous rats. And sure enough, they stopped wasting away. Their tumors shrank. Some tumors disappeared entirely—prompting Dr. Gold to launch a massive crusade to get other physicians to try it. Sure enough, after working with Dr. Gold on a protocol, this patient was “up and about” in a few weeks. Soon more stories like this started flooding in. Cancer victims, who had been withering away, back on their feet in no time, gaining weight, living life. Like Ellen Shaw who had been “flat on her back” with cancer, then two weeks after treatment, was spending a good part of the day outside tending to her garden. All thanks to this compound. So Dr. Gold pressed on. In one of his early human studies, this salt reversed the “wasting process” responsible for most cancer deaths. About 70% of patients saw improvements such as weight gain, increase in appetite, more strength, and pain relief. For some patients, it outright shrank their tumors. During another clinical trial—a randomized, placebo-controlled, human study, the gold standard of research—published in the Journal of Clinical Oncology, it increased the survival time of end-stage lung cancer patients when combined with chemotherapy. The researchers broke modern medical research ethics by allowing subjects to take drugs they knew would interfere with the secret salt! The study was seriously flawed to say the least. But a handful of in-the-know Americans, like Joe Campbell—a university professor—refused to give in. And he would know. Professor Campbell had one of the deadliest forms of brain cancer: glioblastoma multiforme. The survival rate with traditional therapies is about 1%. With very little to lose, he turned to this white powder instead. Joe credits it with destroying his cancer and saving his life. So why did the NCI ignore his and other life-saving results? Is it because one of the lead researchers of the NCI study was the principal investigator of a competing drug from Bristol Myers Squibb…at the same time? Know this: The drug industry employs three lobbyists for every single member of the U.S. House of Representatives. And keep in mind, the National Cancer Institute is funded primarily by the government. Not only that, but the NCI alone doesn’t have the resources to conduct research studies. So it collaborates with—you guessed it—Bad Pharma for almost all of its trials! The sad reality is that when it comes to cancer research, money talks. And chemo, radiation, drugs…that’s a $125 billion-a-year industry we’re talking about…an industry that is widely promoted to doctors, universities, and the public. So of course they never tell you about a dollar-a-day cancer killer. No matter how many lives it’s saved. Hi. My name is Amanda Angelini. I’m the director of the independent research organization, The Institute for Natural Healing. We are a 280,000-strong alliance of researchers, doctors, and health-seeking people like you. Our mission is to seek out the most promising cures and treatments from around the world, backed by solid research and scientific studies. Because we’re outside the influence of the medical establishment, no one can control what we tell you. That way we’re free to bring these breakthroughs to people who need them. Breakthroughs like this secret salt. You see, while the research here in the U.S. may have hit a brick wall, it just kept gaining traction internationally. According to multiple, credible reports, scientists at the Petrov Research Institute of Oncology in St. Petersburg showed that this substance worked for more than half of late-stage subjects. These were patients with very little hope…who’d tried conventional treatments. And hadn’t responded. These same Russian scientists next tested it on 233 patients. 65% of the advanced-stage cancer patients saw improvements like increased appetite and strength. In other words, the salt was reversing the wasting process responsible for most cancer deaths. Not only that, but for some patients, the compound ate away at the actual cancer and reduced tumor size. Like Anna Rabinovich…a 63-year-old woman with lung cancer. She could barely swallow her food, had lost a terrifying amount of weight, and was coughing up blood, according to reports. But just two weeks after starting this therapy, her tumors were shrinking. Her appetite came back. Her cancer was disappearing. And without side effects. Encouraged by the results, the researchers decided to go even bigger for their next study. This next one involved 740 patients. And reverses cancer’s deadliest effect. I’ll show you exactly how in a minute. Like I mentioned earlier, it attacks cancer unlike anything else. And it’s the reason this compound is so effective at fighting even late-stage cancer. But it’s important to take it the right way. And that’s why my research team here at INH has put together a special report called The Forbidden Compound That’s Death to Cancer. Today you can get this eye-opening report for free. You’ll see how in a moment. But I do urge you to hurry. This information is highly sensitive. For example, there are certain prescriptions you’ll need to avoid. There are some common over-the-counter drugs as well (like Claritin) and even some vitamins. Not only that, there are also some foods you shouldn’t eat. Things like pickles, fava beans, soy sauce. So if you or a loved one decide to try this treatment, you’ll need to steer clear of them. Your report includes a detailed list of foods to avoid. But most important of all, you’ll find out how to cheaply, legally, and safely get this potent cancer-fighter for yourself. And then the glucose feeds the cancer to create more cancer cells that create more lactic acid that create more glucose…it goes on and on! The end result of all of this is the wasting syndrome I mentioned earlier. The one responsible for up to 73% of all cancer deaths. And it’s exactly what it sounds like—the extreme loss of muscle, weight, and appetite. Of course, it also leaves you wide open to fatal complications. But the compound I’ve been telling you about stops your body from converting the lactic acid into glucose so that this cycle never kicks off in the first place. A UCLA study published in the journal Cancer, showed that it helped 83% of patients maintain or gain weight. …the 62-year-old patient with cervical cancer, in the final stages of wasting away. She wasn’t expected to live. But after trying this solution, she gained weight, got back on her feet, and out of the hospital. And that’s not all. This treatment we’ve uncovered doesn’t necessarily have to be an “alternative.” If you have cancer and have decided on chemo, it can be used along with conventional methods. For example? Alexander P. was a 40-year-old man with late-stage Hodgkin’s. He’d suffered through 10 mainstream treatments back-to-back with no success. 10! So his doctors put him through a course of the secret salt protocol, then back on the chemo and, suddenly…he went into total and complete remission. 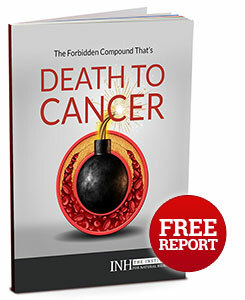 You’ll discover more of these success stories when you claim your free report The Forbidden Compound That’s Death to Cancer. But, more important than anything, you’ll find out how to get your hands on this powerful and effective solution right here in the USA. You’ll be surprised when you discover the 100% legal loophole that allows you to buy this treatment online. There are two forms of this compound available. We tell you which one to get and which one to avoid. This is important. We also identified two reputable manufacturers who sell this supplement. One of the options is even “medical-grade.” And don’t forget, it costs about $1 a day. But I cannot stress this enough…time is very much of the essence. There is no telling how long we can keep this information online. Now, I can’t say for sure that this treatment is right for you. But I do believe that you have every right to at least know what your options are. And since you’ve followed along this far, you already understand that true alternatives do exist. This is proven, safe, and inexpensive. We’re talking real science…real doctors…real people cured. In a moment, I’ll show you how to get access to this cutting-edge research, free of charge. Before I do, please allow me to fully introduce my organization: The Institute for Natural Healing. Independent Healing was founded on the idea that everyone has a sovereign right over their own bodies. And that means having access to all of the cures and therapies available, not just those approved by the medical monopoly. And to support that right we publish new, hopeful, and science-backed findings from around the world so that our readers can decide for themselves which course of healing they want to follow. Yes, dear readers, it’s INDEPENDENT HEALING. And, it comes through The Institute For Natural Healing. That’s the source of this information. I credit them, and I promote them. My mother died, unnecessarily, from the very brain tumor which responds to the treatment described above. In her honor, I spread this to you.